Over the last 12 months HCL performed consistently and cross the revenue milestone of $8 billion. HCL’s revenue per employee is the highest among its peers in industry and global competitors. HCL is among top 3 revenue per employee firm in the world. HCL’s EBIT per employee is also highest and better than some of the largest consulting firms in the world. HCL recorded Highest ever bookings in Q1FY19, led by next-gen infrastructure services and a variety of its Mode-2 services primarily Cloud-Native and digital offerings. HCL had 27 transformational deals in Q1, Nokia networks was the largest programs greater than $0.5 billion in TCV that it won. HCL was very Effective in cross selling and up selling in its existing clients to deliver the better metrics. Reduction of $12 million in its India SI business and it has come down to 0.5% of HCL’s revenues. HCL successfully integrated the C3i acquisition which it started early in the last quarter. It announced new acquisition with H&D international in Germany. Geographic expansion is one of HCL’s inorganic strategies in addition to IP and digital or Mode-2. This will be helpful to HCL in automotive sector where there were some disruptive infrastructure transformation programs to enable autonomous vehicles. Mode 1 revenues continues to be stable and Mode 2 & 3 combined revenue stand for 26.6% of total revenue. Mode 2 business has grown 8% QoQ. HCL has built several innovation labs across the world for Digital, Analytics, IoT Works and Cloud-Native. It has invested significantly in the pivotal Cloud-Native partnership. Mode 3 business is 11% of its revenues. The margins are 25.2% at an EBIT level, significantly higher than company level margins. Mode 3 consist of two sets of products, one set of products are enabling Mode 1 products and these are mature products in mid or late stage of their lifecycle, these are 60% of total products. Cloud is a means to drive innovation, new capability, drive modernization of applications, help, build more digital applications. They leverage all the new capabilities on AI, Cognitive, Cloud-Native. Infrastructure shifting from core infrastructure to application infrastructure platform and data infrastructure. Hyper integration between infrastructure and make it more agile to serve the digital needs of an enterprise. Chang e in Operating Model - driving autonomics at the center, significant AI machine learning and those capabilities. Product and platform market is growing CAGR 10% - 15 % in the industry. HCL is improving its capabilities in this field by leveraging IP partnership, expanding engineering functional team. Integration of Mode 1 and Mode 2 products to enhance capabilities to supplement HCL’s managed service and outsourcing offerings to customers. Transformation of the products in mature life cycle or having single digit growth into next generation products. Cross market digital footprint of HCL with upsurge in retail, CPG and healthcare. HCL helps industry replacing their old IoT systems or traditional application service because of rising demand of next generation technology. Growth in Life sciences enabled by CPI and Public services is very organic. 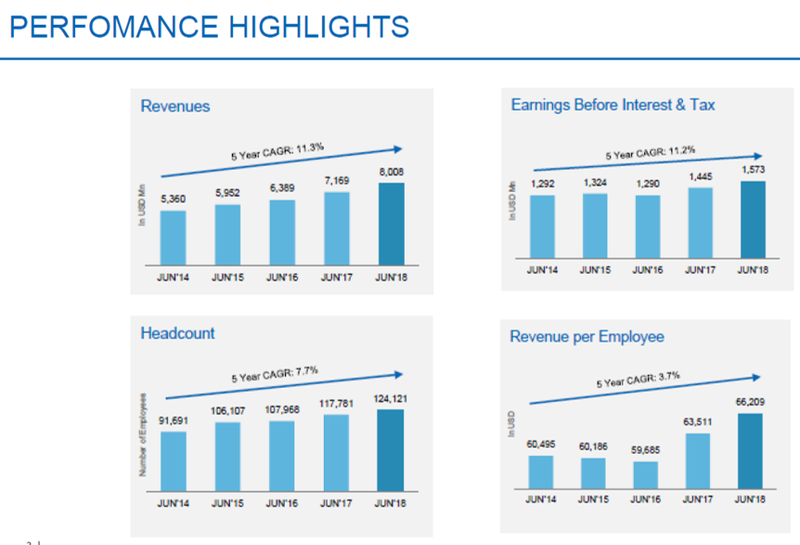 HCL has very promising Organic growth rates. He alth and financial services had grown 9% LTM YoY, Retails and CPG has grown 7% YoY, Life Sciences has grown by 10% YoY. Mode 1 margin is very consistent with company level margin. Mode 2 margin is little lower than company level margin due to heavy investment in that area. Mode 3 margin is very much higher than company margin. More decent business split of HCL would be 60% of businesses in mature products and 40% in high growth. Its IP partnership is also decent mix of mature and high growth products. HCL has imbedded IP partnership and products into its outsourcing businesses. Its regular Mode 1 businesses consisting of infrastructure business and engineering business have a lot of opportunities to re-innovate and differentiate and thereby create higher growth opportunities. HCL’s EBIT margin YoY has been declined due to renewal and structure reduction happened at the beginning of the year. Most p art of the segmental earning has been invested in cloud and security. Within Mode-3, 40% revenues are new technology and 15.5% are Mode-2. Cloud services Private cloud and utility services are classified as Mode 2 service has a lot of scope for investment and improvement. 130 bps of guidance is built through acquisitions. Ci3 acquisition which had single digit EBIT margin has impact on gross margin decline. Tax assumption for FY 2019 is 22-23%. Net investment is 177 million , however the number look small (125 million) on financial statement due to currency effects.